A Day to Remember – For all of us! Saturday was a day we will all remember, not for what anyone did, but for who we met! Thank you Heather, for allowing us to share time with your son and family. We don’t kno w what to say, or how to say it. 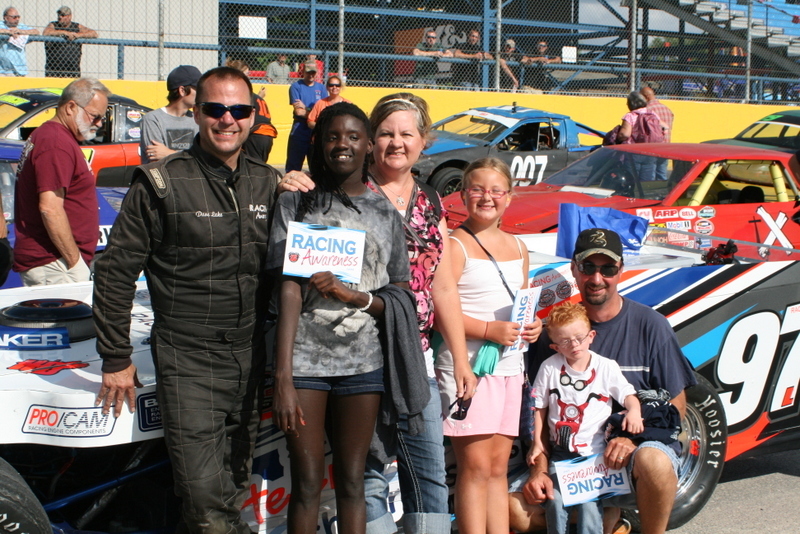 I hope our faces-at least in part–spoke of our gratitude for your organization RacingAwareness.com and for your kindness towards total strangers. The past four years have been the hardest years of our lives. Fraught with constant illnesses, accumulating diagnoses, cancer scares, debilitating malnutrition, and health care split between two different health systems our lives have been forever changed. We have learned to live differently, love differently, and hold on a little tighter to each moment. In the first three and a half years there were no outings, no mom and dad dates, no trips to the beach, just living in the moment–from crisis to crisis and hospitalization to hospitalization. The past 12 months have not been easy either, with winter virus’s constantly beating his little body down, and fighting a never ending battle against weight loss, malnutrition and dehydration, despite his feeding tube. Behind Rhyse’s cute, little smile and fire engine red hair is a fragile, medically complex little man. Rhyse was born with Noonan Syndrome. A syndrome that affects every single cell in his body, to differing degrees. From oral aversion/dysphagia he is unable to eat anything beyond a cracker or bread so he is tube fed. With hypotonia (poor muscle tone) he is unable to do much of what a four year, nearly five year old can do: dress and undress himself, carry anything over a pound, open and close things, snap snaps, take his shoes on or off, etc. With ulcerative colitis he is unable to be potty trained at this time, and endures 4 hour infusions every six weeks to suppress an already broken immune system opening him up to every virus and bacteria that passes by. He has slings in his eyelids (ptosis) to hold them above his pupils. At night he wears a body brace in a hopeful attempt at straightening his curvy spine, all the while being attached to his feeding pump. A wicked combination that makes every single night a battle against tangled feeding tube lines and a brace that restricts his movement. And the list goes on. Every day childhood illnesses put kids like Rhyse in the hospital. And the fear and anxiety we as a family have faced, and still live with, goes well beyond words—and yet we have joy because he is joy! And it truly is the little things that mean the most to all of us. In Rhyse’s world anything on four wheels is heaven on earth! For every appointment, hospitalization or procedure a carefully chosen vehicle goes with him. He lives and breathes cars, trucks, and emergency vehicles with engines that always need fixing and whose tires go flat–and tow trucks that save the day! 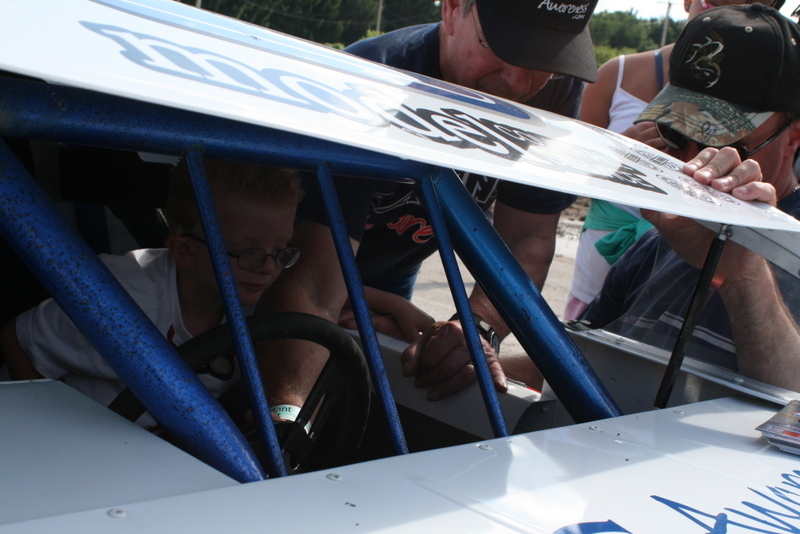 Since he was very little we have always said, “he must have a car gene in there somewhere!” So, as you can imagine, treating him and his family to a night at the raceway was the penultimate gift to him and us. When he suffers we suffer, and when he has joy, we have joy! Again, on behalf of my family, and the entire Noonan Syndrome family around the world, THANK YOU Jeff Striegle, Dave Lake, Lisa Davan, Erika Welch and the rest of the team for your kindness, humanness, autographs, invitation to victory lane, ride in the pace truck, and the most mind blowing, gifting the trophy to Rhyse!!!! What an amazing token of unselfishness that he will remember for the rest of his life! 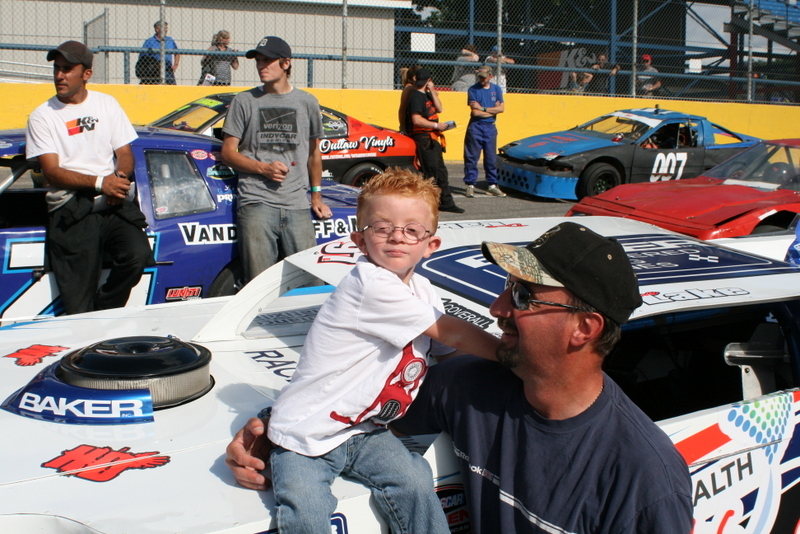 “RacingAwareness.com and Racing Awareness Inc. are two separate entities that were created with the sole intent of providing children and their families from Helen DeVos Children’s Hospital, of West Michigan, who are experiencing or have experienced an illness or injury of a child, a diversion from the healthcare process utilizing the sport of auto racing”. 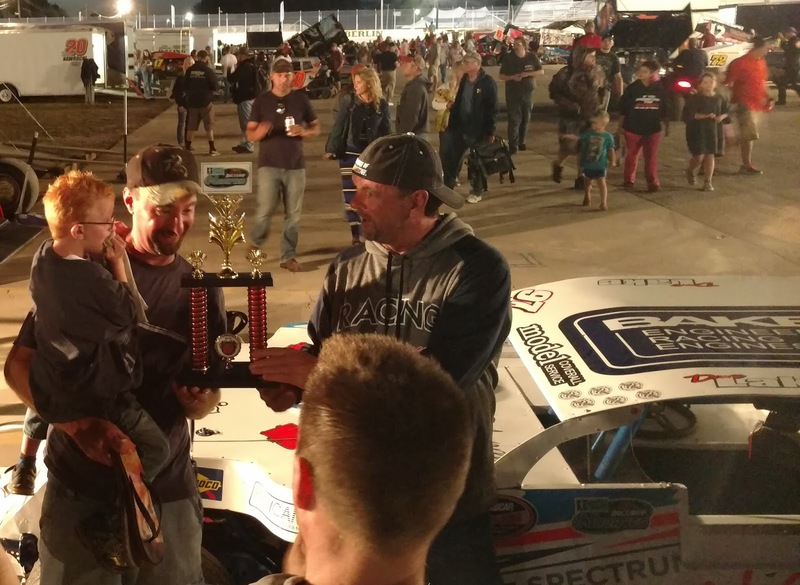 You can read all about the team, and the little boy who inspired the formation of Racing Awareness.com and Racing Awareness Inc. on their site. Batman Returns To The Berlin Raceway!